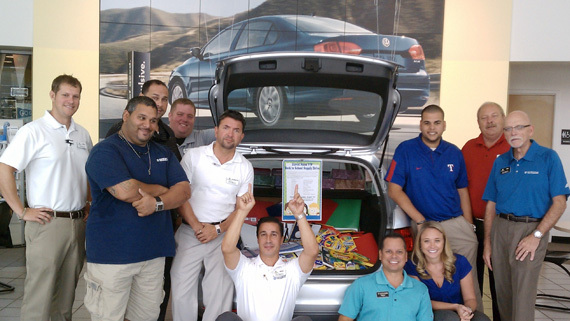 David Maus Volkswagen School Supply Drive A Success! 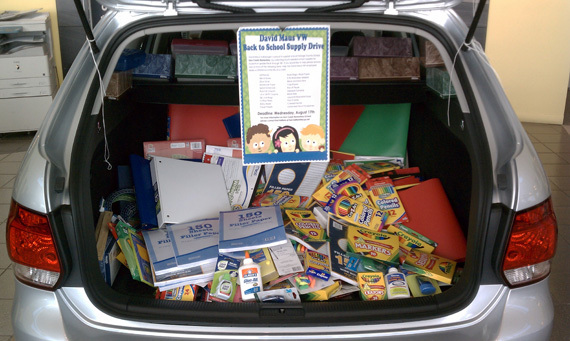 Employees and customers of David Maus Volkswagen South donated a trunk full of school supplies to Pine Crest Elementary School for students to use for the new school year. A huge thank you to everyone who participated, we appreciate your support as we do our best to make a difference in the life of a child! Through the CARE Program, David Maus Automotive dealerships team up with local schools to help with basic needs for students. We hold book drives, school supply drives and will be scheduling group clean-ups at various schools that are in need. The CARE Program has also formed the Literacy Project in which employees go to local elementary schools and read to the students. It is part of the David Maus philosophy to give back to the local community as much as we can. Through various initiatives, such as the CARE Program and the Literacy Project, we are doing our best to make an impact on the lives of our local students. David Maus Volkswagen South is proud to support a local Orange County School, Fern Creek Elementary, by collecting much needed school supplies for students in grades Pre-K through 5th. If you would like to help, please bring your donation to David Maus VW South is located at 5474 South OBT, just 2 miles north of the Florida Mall. Help the David Maus VW employees Make a Difference in the life of a child!